How long does your website take to load? A huge percentage of responsive websites are taking too long, according to a study from US mobile development solutions provider Trilibis. A little over two-thirds of responsive websites were found to be image-heavy, which was the main cause for their prolonged load times. Today, many brands choose responsive web design for their websites to create a better user experience. And they are right to do so, but it turns out that some still fail to adopt responsive web design properly. Trilibis looked into the responsive websites of 155 brands, among them Engadget, Starbucks and Bold & Noble, to examine their page weight, load times and images. The study found that 69% of the websites required four seconds to load, and some of them needed even more. Trilibis also found that just 20% of the websites delivered acceptable load times on a smartphone, while a massive 31% of websites took between eight and 48 seconds to load. And who wants to wait almost a minute for a site to load? The study revealed that image-heavy websites are the slowest to load and that a website's loading time becomes unacceptable for users if the page weight is more than 1 MB. Of the websites monitored, 61% had a homepage of at least 1 MB, with images making up 50-60% of the website's page weight. Of course, there are many other factors that influence a site's overall weight, but images are the main contributor. This is especially the case with responsive websites, because they deliver the same content across multiple platforms, which results in large images being loaded to small screens, such as those on mobile devices. The 155 websites' mean load time was 7.95 seconds, with a median load time of 5.82 seconds. Of all websites, the fastest load time measured was 0.54 seconds, while the slowest recorded was 48.08 seconds. The firm also tried to reduce the websites' weight and thus load times of the 64 websites with homepages over 1 MB. Trilibis managed to minimise the page weight by 77% on smartphones by optimising every image on the 64 websites. Before the optimisation, the total image weight of all those websites was 115 MB. But carrying out this process drastically reduced the weight of the websites' pages for all platforms. If you think your responsive website could benefit from some expert attention, we can help. Speak with one of our specialists and make sure your website creates a happy user experience. We are all familiar with responsive web design. If not, you probably just don't know it yet. More and more websites are being designed to adjust automatically to the size of the device it is opened on – desktop, smartphone or tablet – and for good reason. This technology can benefit businesses in a number of ways. Responsive design provides a better user experience and faster opening speed compared to native apps and mobile websites. Responsive websites are also easier to access via the Internet without the need to download an app. The convenience of only having one website to maintain is a great advantage for businesses. Any changes to the website are made just once and are seen across all platforms. By focusing on one website your site is more likely to run smoothly. Managing more than one website can become confusing. It is also easier to send updates to users, without having to consider app stores' rules or other regulations. Another important benefit of responsive design is that it is cost-effective, especially compared to the development of mobile-friendly websites and native apps. It is easier to develop and to maintain as it has the same source code for various operating systems. The website content can be quickly updated via a content management system (CMS). Using a WYSIWYG (what you see is what you get) interface, means edits are much easier than in HTML code. Responsive websites also simplify the call-to-action, which is useful for marketing purposes. This is also helpful in terms of website traffic, as it generates traffic to one domain only, making the website more appealing to search engines and increasing the credibility of the website. Responsive websites allow users to directly interact with your company, which is almost impossible to achieve through an app. This in turn can provide valuable customer insights from website metric systems, which are more sophisticated than native app analytics. Finally, social media has a huge mobile audience. Linking products, content, services and discounts or offers from your website to social media channels can be a huge advantage for any business. If you would like to find out how a responsive website could benefit your business, get in touch with us to discuss your options. Almost every modern business has heard of the term 'user experience', but not realise just how important it is for their company. Businesses that are willing to remain competitive in today's crowded, constantly changing mobile application market need to see user experience as the key to their success. 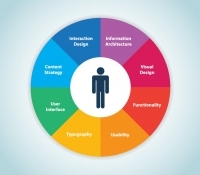 Intuitive design provides the most satisfying results for users and is considered to be the right approach. At the same time, intuitive apps are the result of many user experience approaches that when combined create "a feeling of contentment", according to UX Magazine. But user experience is not just about good graphics. It needs to take into account the whole experience when a user interacts with a product, a brand or a service. It foresees the user's needs and engagement before assessing the technological element. In order to design an app, first you have to identify your target audience. Usually, developers conduct research and review a large portion of market and demographics data. Some studies show differences between app consumption habits of men and women. For instance, women install 40% more apps than men, they purchase 17% more paid apps and pay 87% more for them, according to data research of 500 million users carried out by mobile analytics firm, Apsalar. The study also found that female users use apps more often than men - 600% more social media apps, 90% more news apps and 89% more productivity apps. That said, developers need to pay more attention to the discovery stage. Researching the market can help them better understand the competition and thus identify the advantages as well as the issues they could face. App developers should focus on more practical, user-focused app designs, because applications today are becoming a richer, more human and content-concentrated experience. Businesses need to study how users interact with the different design elements in order to understand the patterns in usage as well as considering the feelings and emotions generated by the app's design. Finally, developers need to ensure that the design process for each app and brand is different. They have to concentrate on the app's real purpose - to increase its value. The perfect user experience must generate a positive emotional connection between the user and the business, not just between the consumer and the app. The application must also create value for the brand and at the same time deliver a unique mobile experience to the customer. Today, the Internet is an integral part of our daily lives. And given the rapid pace of smartphone adoption, it is imperative for brands to be prepared to deliver to users the best possible experience on those devices. To achieve this, companies need to adjust to the ever-changing market and plan a responsive design for their website so that it can be viewed on devices with different screen sizes, as well as on desktop computers. Responsive web design is a relatively new approach, but there are many large brands already adopting it to reach their target audiences, regardless of the device used. However, companies must be aware of some mistakes made in the process of using responsive web design. Here are some of the blunders that marketers need to avoid, as outlined by Business 2 Community. The most common mistakes in responsive website development usually occur in the planning and development processes, as many developers wrongly believe it is easy to create a website for desktop and then develop a design for mobile devices. Always first develop the mobile website first and then move on to create a desktop version – it is much easier to adjust the site to a larger screen than the other way around. Developing a responsive web design does not mean creating a desktop website and simply shrinking it to fit mobile devices. This approach can ruin the website's appearance on mobile. For this reason, use responsive interfaces, as they best fit the requirements of mobile devices. Another mistake is offering too much content on mobile devices. Keep in mind that smaller devices mean less space and less space means that you should include less content. The content should only feature the most important information about the company – contact information, locations, nearest store, services, etc. Brands also need to be aware that there should be less data to load on a mobile device than on a computer. Data that appears on a computer screen in seconds can take minutes to render on mobile – which can be frustrating for the user. Long load times could even prompt users to turn to another brand that provides a better experience. Finally, as touchscreens dominate the mobile market, it is a must for brands to create a mobile version that works perfectly on touchscreen devices. Avoid these traps and you are well on your way to developing a responsive website that is right for your business. Speak to one of our in-house web designers who can give you advice about our bespoke design service and your particular requirements.